The Jewish holiday Hanukkah literally lights up the home. The eight-day, 2,000-year-old holiday, also called the Festival of Lights, celebrates God's glory, an ancient victory of the Jews over their enemies, and the freedom Jews enjoy today. The story of Hanukkah begins in strife. Antiochus, a Greek who was king of Syria, marched with an army of soldiers into the kingdom of Judea, home to many Jews. He insisted that the Jews worship the Greek gods rather than the one God they worshipped. When the Jews refused to worship the Greek gods, the soldiers attacked the Temple in Jerusalem and killed countless Jews. They stole holy objects. They even stole the sacred lamp, called the menorah, that stood before the altar. The lamp's flame, which always burned brightly, went out. That had never happened before. Special oil stored in small containers called cruses was always used to keep the flame alive. The soldiers dumped the oil all over the floor. As a last insult, they let pigs roam in the Temple. The king returned to his own country, but the soldiers stayed on. They did not respect the Jewish Temple. They brought food and drink in, played noisy games, and shouted and laughed there. Jews could not say their prayers in the Temple. One old man, Mattathias, wanted to fight to take back the Temple. He went with his five sons into the wilderness, where other families joined them. The men began to fight the enemy anywhere and in any way they could. Mattathias became sick. He named one of his sons, Judah the Maccabee, the leader of the fighting band. For two years the Jews fought their enemy. Then one night they attacked Jerusalem, the enemy stronghold. Judah the Maccabee and his followers camped outside Jerusalem all winter. When the people inside had little food or water left, they attacked and overwhelmed the enemy. The Jews were free! One of the first tasks of the Jews was to clean up the Temple. They restored the holy lamp -- the menorah -- but found only enough clean and holy oil to last one day. Yet the flames of the menorah burned steadily for eight days. With each passing day, the flames grew brighter. People eat potato latkes, exchange gifts, and play dreidel games. And as they gaze at the light of the menorah, they give thanks for the miracle in the Temple long ago. Language Arts. Listening. Invite students to listen as you read aloud the above story of Hanukkah. Then ask the listening comprehension questions below to find out how well they understood. Read aloud. Read aloud from one of the popular children's books about Hanukkah. For children age 3-6, try the imaginatively illustrated picture book Hannukah!, written by Roni Schotter and illustrated by Marilyn Hafner (Little, Brown, 1990). A winner of the National Jewish Book Award, the book tells the simple but compelling story of how a family celebrates Hannukah. For children age 7-9, The Story of Hanukkah, written by Amy Ehrlich with paintings by Ori Sherman (Dial, 1989), is a good choice. The text is direct and poetic; the paintings are sumptuous, conveying powerful emotions. For ages 9 and up, the chapter book Light Another Candle, written by Miriam Chaikin and illustrated by Demi (Clarion, 1981), has a great deal of fascinating detail and puts the story into historical perspective. Art. Create a Noah's Ark Hanukkah Card. Adapted from Hanukkah Crafts: A Holiday Craft Book by Judith Hoffman (Corwin Franklin Watts, 1996). You will need: a pencil, an 8-1/2- by 11-inch sheet of white paper, a fine-line black marker, colored pencils or markers, and a piece of ribbon or yarn. On the white paper, use a pencil to draw an ark, Noah and his wife, and pairs of animals. You might show the elephants, lions, ducks, rabbits, cats, zebras, giraffes, and so on. Go over pencil lines with the black marker. Color in your designs with markers or colored pencils. At the bottom of the sheet, write a Hanukkah greeting and sign the card. Roll up the sheet of paper, tie a ribbon around it, and give it to a friend. Culture. Play the classic dreidel game that is often played during Hanukkah. A dreidel is a kind of top. The four letters on the four corners of the dreidel refer to the Hanukkah miracle. Write and perform a radio show. Use the story of Hanukkah above and/or a book or two from the Resources list below. Arrange students in small groups to focus on a different but related aspect of Hanukkah. (An example would be a scene where the victorious Jews clean up their Temple and light the menorah again.) Have students rehearse their scripts and then do performances of radio broadcasts in the classroom. Tape record their broadcasts. The Family Treasury of Jewish Holidays by Malka Drucker (Little, Brown). The collection of information about Jewish celebrations helps readers understand the meanings behind the rituals. It includes stories, songs, craft projects, and recipes as well as lovely illustrations. 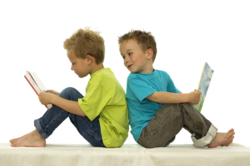 Reading aloud, 4 and up; beginning readers, 8 and up. Grandma's Latkes by Malka Drucker (Harcourt Brace, 1992). A girl helps her grandmother make latkes, and her grandmother tells her the story of Hanukkah. Painted woodcuts illustrate the story. Reading aloud, 4-8. Hershel and the Hanukkah Goblins by Eric Kimmel (Holiday House, 1989). In this "trickster" tale, a crafty old man rescues Hanukkah from goblins who hate it. Reading aloud, ages 5-8. Chanukah Fun by Toli Marcus Minelli (Tupelo, 1994). A fun book of Hanukkah crafts and activities. Ages 6-12. Light the Lights by Margaret Moorman (Scholastic, 1994). This book about an interfaith holiday celebration tells of Emma, a girl whose family gladly observes both Hanukkah and Christmas. Reading aloud, ages 3-7. Hanukkah Fun by Judy Bastyra (Kingfisher, 1996). A crafts book includes fun and different projects. Ages 7-12. There's No Such Thing as a Chanukah Bush, Sandy Goldstein by Susan Sussman (Albert Whitman, 1983). An account of what it feels like to be Jewish when everyone else seems to be celebrating Christmas.